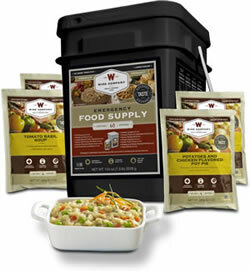 As you journey down the path of disaster readiness, you’ll no doubt amass some sort of food storage. This might be special freeze-dried and/or dehydrated foods or perhaps just simply stocking up on some extra canned goods and other “normal” foods your family eats regularly. Whether you take one particular approach or maybe a combination of the two, you should also plan for various methods of cooking food in the wake of a disaster. One of the first things to go when a crisis hits is power. Suddenly, that microwave oven is just one more bit of clutter on the kitchen counter. Many people have electric ovens and stove tops too, which won’t be working. Fortunately, there are many possible options for offgrid cooking. The simplest, at least in terms of advance preparation, is a campfire. After all, mankind has been cooking over an open flame for thousands of years. If this is an option for you, I would suggest you lay in a supply of branches and split wood and practice cooking in this way from time to time. There is just as much art as there is science to campfire cooking. Keep in mind, you’ll typically get more heat, as well as a more constant temperature, cooking over glowing coals than you’ll get cooking over the actual flames. Of course, many of us already have charcoal and/or gas grills on our decks and patios. These work very well for cooking just about anything you’d prepare over a regular stove burner, provided you have fuel for the grill. If you have a charcoal grill but run out of briquettes, you can always just use sticks and branches, making sort of a contained campfire. Patio fire pits are also very common and serve as portable campfires. Again, be sure you have fuel for them. If you want to explore this option, what I suggest is you hunt around for an old grill grate and place that over your patio fire pit. This will make things much easier when it comes time to warm up water for coffee or hot chocolate. Folding camp stoves are great to have on hand for emergencies. Very small and compact, they won’t take up much space on a shelf in the garage. While you won’t be preparing any elaborate, five course meals on these nifty little gadgets, they work great for a can of soup or stew as well as boiling some water to purify it. Larger gas camp stoves are also excellent additions to the home preparedness gear. Again, you’ll need to stock up on fuel for them. You could go with the small propane tanks they sell for camping or invest in a converter so you can use the larger tanks you’d have for a patio gas grill. Moving one more step up in the chain brings us to rocket stoves. These come in a variety of shapes and sizes. The basic idea is you’ll have a combustion chamber at the bottom of the stove, where you’ll burn biomass like sticks and branches. Rising up from that chamber is a chimney, carrying the heat to the top where you’ll have your cook pot. Because of the way these rocket stoves are designed and insulated, it doesn’t take much fuel to create quite a bit of heat. My suggestion is to plan for at least three different ways to prepare food during an offgrid emergency. For example, have a gas grill on your deck, plus a patio fire pit and a spot in the yard for a campfire. Always be sure to have plenty of fuel on hand for each method, too. A great addition, as well, is a tripod grill. You can find these at any camping store. They consist of three metal poles that are set up like a teepee, with a chain running down from the top to a circular grill. These work tremendously well if you’re cooking over a campfire or patio fire pit. Whether you’re lost in the woods or out for a night on the town, it is important to plan ahead and anticipate needs before they arise. This, to a large degree, plays into situational awareness. For example, let’s say you went out hiking and somehow lost your way. As you try to puzzle out the correct path to take, part of your mind should already shift into survival mode. Mentally inventory the gear you have with you. Begin looking for a good place to bed down for the night, should it come to that. Gather seed pods or other tinder as you go along, stuffing it into a pocket for use later. Earmark potential sources of water so you can come back to them if need be. Pay attention to the flora and identify some wild edibles you might add to the cook pot that evening. On the urban side of the coin, any time you enter a building, make note of where the emergency exits are located. Get in the habit of mentally planning an escape route. Given how frighteningly prevalent mass shooting incidents have become, this is just common sense. Keep track of your walking route so you know how to get back to your vehicle in a hurry. Look for places where you might be able to hunker down for at least a short time, long enough to collect your thoughts and make solid plans. Anticipating needs and making plans to meet them is just part of survival. How Are Your Vegetable Gardens Doing? Here in the Upper Midwest, it seems like winter ended just last week. Given that we were still seeing frosts at the end of May, that’s not too far off, I guess. As I mentioned yesterday, we’re still working on our main vegetable garden. Oh, we have some smaller garden beds with strawberries, asparagus, and some herbs as well as planters with taters doing quite well, actually. But, until recently the ground was just too saturated for us to do much with the main vegetable garden. We needed to redo the retaining wall before we could do much else. Now, truth be told, my wife is the gardener in the family. I’m just the grunt labor. I dig where she tells me to dig. Some people have green thumbs? My wife has green fingers, hands, and arms. Seriously, we have more plants than Carter has pills. Anyway, I bring this up to illustrate a point. Due to drought, many places had poor growing seasons last year, right? Garden production was way down so even those who normally are able to grow most of their own food were in a bind. Then, this winter seemed to last forever and gardens are going in much later than normal, at least around here. While many people plan to expand their gardens in the wake of a crisis so as to grow more of their food, what if Mother Nature doesn’t cooperate with that plan? Any number of factors could come into play and result in a poor growing season — drought, floods, infestation. You can have all the heirloom seeds in the world and they won’t do you a darn bit of good if you can’t get them to grow. Yes, you should absolutely have seeds and supplies to grow your food. But, that shouldn’t be the ONLY plan. You should also have an extensive pantry and long-term storage foods to provide for your family in bad times. Posted on June 11, 2013 June 11, 2013 Author Jim CobbCategories DIY, Everything Survival, Skills1 Comment on How Are Your Vegetable Gardens Doing? When we talk about a “prepper toolbox,” we’re not really referring to physical objects but rather skill sets to learn and practice. I’ve talked before about how all too many preppers have sort of blinders on and become so focused on one aspect they let others fall to the wayside. This happens with food storage, with wilderness skills, and perhaps most often with security. Think of all your preparedness skills as tools, each with different uses. If you focus too much on security, for example, you may end up with a toolbox filled with all sorts of hammers…when what you really need is a slotted screwdriver. Your toolbox should have an assortment of tools to tackle a wide range of tasks. –How to start and feed a fire under adverse conditions and with various implements. –How to properly store food long-term. –How to purify water using a wide range of techniques. –How to keep their family safe and secure. –How to improvise and think outside the box. –How to build an expedient shelter using whatever materials might be at hand. –How to turn off the gas and water in their home. –How to put out a fire that is getting out of control. –How to provide basic first aid, at a minimum. –How to identify several different edible and otherwise useful plants. Once upon a time, many of the skills we consider related to disaster readiness were really just commonplace. Few people DIDN’T know how to light a fire and cook over it. In our modern society, with all our technological conveniences, we often take these sorts of things for granted. If we’re hungry, we just pop something in the microwave and, voila, we’re ready to chow down. But, what if the power is out and that nuke machine is nothing more than a heavy box? Make a commitment to yourself today to learn a new skill. Pick something you’ve always wanted to learn but just never got around to doing. Do your research, find a teacher if necessary, and then practice, practice, practice until you get it right. Always look for ways to add to your toolbox! In some districts, school is already done for the year. In others, like ours, we still have a couple weeks to go. This summer, in addition to family trips and such, my wife and I are planning our own version of summer school for our boys. Studies have shown that children’s study skills deteriorate over the summer break if they aren’t being challenged. With reading in particular, they can fall two or three levels in just that 8-10 week period. Therefore, we’re going to have them doing book reports and research papers, as well as practicing math skills and learning about science and history. –Making fire – different types of campfires, ways to get them lit, how to keep them fed properly. –Shelter building – lean-tos, debris huts, etc. –Finding north without a compass. –Locating water sources and purification methods. –Target practice with bow and air rifles. Not only will these lessons teach them valuable skills, they are an opportunity to brush up on some of them myself. If you have children, I challenge you to do something similar. Summer should definitely be fun but that doesn’t mean they can’t learn a thing or two along the way. As prepping and survivalism grows ever more popular, it seems not a day goes by without someone else hanging out the proverbial shingle, advertising survival instruction. Some, probably even most, of these people are qualified in some way to teach the subject. They might be military veterans who have received extensive training as well as been tested under fire. Others have simply been living the life for many years, having learned at the knees of those who came before them. There are, though, a fair number who just read a few books and figured that’d be good enough. They might be very convincing and charming and know all the cool slang terms. But, when push comes to shove, they couldn’t get a decent campfire going if you gave them a Bic lighter and a cup of gasoline. How can you know the instructor is really legit? The first thing to do is check out their purported credentials. Just as with anything else, if they sound too good to be true, they just may have inflated the ol’ resume here and there. Most commonly, I see this with military service. They will tell you they are an ex-SEAL / Green Beret / Ranger / whatever. If that’s truly the case, they shouldn’t have any qualms about sharing with you their DD-214, which is their official military service record. Ask to see it. If they balk, ask why. If they cite security clearance or something, just walk away and find another instructor because odds are they are just BSing you. Bear in mind too that military service and training doesn’t automatically qualify them to teach anything. An analogy — I’ve shared with my readers before that I work as a private investigator. Now, I’m pretty damn good at what I do, primarily because I’ve learned from some of the best in the business. Becoming a private detective is one of the go-to plans for retiring law enforcement officers. Just because a guy wore a badge for 25 years doesn’t automatically qualify them to be a competent PI. Depends on their training and background, right? I mean, if the guy was essentially running speed traps for 15 years, how in the world does that equate to finding a missing person or taking a statement from a witness? So, just because a guy was in the Army for 12 years, that doesn’t mean he received more than just basic survival training. Sure, that might be more than you have had yourself but if you are going to pay someone to teach you how to survive in the bush, wouldn’t you want that person to be as highly trained as possible? Please note, I mean absolutely no disrespect to any military veteran with the above. Anyone who has signed on to do a hitch in the military gets my honest gratitude and support. My point is simply that there are some vets out there who want people to think they have had more training in certain areas than really ever took place. If the instructor has passed the initial sniff test, look for reviews online. Find out what other people are saying about the school. Pay particular attention to negative reviews and read them closely. It might be that the person and the instructor had something of a personality conflict, which may or may not affect you. It could also be that the reviewer is simply a buffoon and couldn’t be bothered to even try learning the most basic skills without complaining. Remember, every school is different and each instructor has their own style of teaching. You may not do well with someone who is hollering at you like a drill sergeant. Then again, maybe that’s exactly what you want. Finally, find out how long the school has been around. If they’ve been in business for the last 15 years, odds are they are doing something right. However, if the ink isn’t even dry on their sign, you might want to think twice about parting with your hard-earned cash just to be a guinea pig. Cordage is one of those things you could make in the field, at least theoretically and provided you found the right plants. But, honestly, it is so much easier to just pack some in each of your survival kits. There are just so many tasks that are made infinitely easier with even a shoelace, let alone several feet of good quality paracord. –Lashing together an expedient shelter. –Hanging food from a tree to keep it away from animals. –Tying gear to your pack. –Bow drill for starting fires. What I think is one of the coolest features of paracord is that in spite of the incredible strength, it is much thinner than you might expect. Seriously, I have shoelaces that are thicker. What this means is you can easily fit a dozen feet or more in even a very small survival kit. Coupled with having cordage is knowing how to use it effectively. I highly encourage preppers to head to their local library and find a book or two on knots, then practice some of the more useful ones like the square knot, the bowline, and the clove hitch. We preppers talk a lot about survival skills like identifying wild edibles, canning and preserving food, or marksmanship. Make no mistake, these are all great skill sets. But, for many of us, we don’t necessarily need to utilize those skills on a daily basis. When I use the term “everyday survival skills,” I’m talking about the skill sets most of use on a very regular basis, even if we might not think of them as necessarily being “survival” related. One such skill is creative problem solving. Whether the problem is trying to get all the bills paid each month or a troublesome alternator, we often find ourselves having to think outside the box a bit. This is a vitally important survival skill. We all know, or should know, that survival situations rarely ever follow any sort of exact timeline or sequence of events. By strengthening your creativity, you will be in a better position to come up with workable solutions, even in perhaps the most dire circumstances. Another is conflict resolution. All too many preppers I hear from have sort of a bull in a china shop approach to potential conflicts. While there may certainly be situations where that mindset is warranted, we don’t see much of it in our daily lives. Instead, preppers should work on honing their negotiation skills as well as just being able to talk to others in an effort to resolve problems. Sure, if someone is a physical threat, you’re not necessarily going to try and talk them down from the ledge, so to speak. But, if it is a co-worker who is just dogging you, the first instinct (to knock them upside the head, perhaps) may not be the best. We’ve talked a fair amount about situational awareness. This is an important skill to practice daily, yet one many people still struggle with. What other skills do you feel have practical value for survival?